This section deals with all sorts of mods that are powered by various Duke3D source ports. New users should immediately familiarize themselves with relevant files such as EDuke32, the High Resolution Pack and Jonof's Port. I recommend that everyone should use EDuke32. 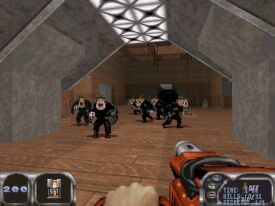 DeeperThought's WMD mod adds a whole new spin to Duke3D. The basic idea is this: you start with relatively poor stats (health, speed, weapon effectiveness, strenght etc.) and by killing enemies you gain coins (these coins can only be spotted by wearing Dimension X Goggles, basically night vision goggles) with which you can purchase various skills and enhancements. So it's a bit like a role playing game type of experience point system. There are also new enemies and some of the olds ones have been upgraded. Dimension X has its own enemies so there's a danger every time you turn on yer goggles. All weapons now have two firing modes and Duke has an arsenal of new tricks in his pockets like a Dukebot that fights alongside you. 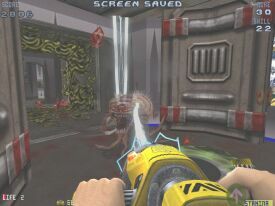 DNWMD breaths fresh air into Duke3D. The whole game feels like a different deal. Worth noting is that DNWMD is quite a bit harder than the original game. 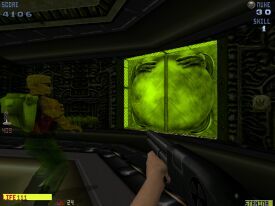 Sometimes (during the last levels of each episode - see Derelict for example) the going gets very tough with various minibosses and tons of monsters facing you room after room. However, this is balanced by Duke's enhanced abilities (just keep collecting those coins). 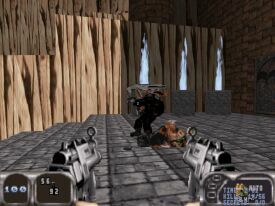 Someone at 3DRealms forums criticized the system where you have to collect coins instead of just gaining them in a true RPG way by killing enemies. This is a good point, since sometimes searching for Soul Coins is just too much of a hassle. However, Dimension X definitely has its place in the game. Make sure that you read the html guide completely in order to find out all the necessary commands and functions - you're going to need them. DNWMD also works fine with many usermaps. There are also two new episodes consisting of the best usermaps around (the sixth episode has been entirely dedicated to the Roch serie) plus the Duke DC episode (available only if you happen to own the add-on). More relevant information, downloads and future updates (the mod is frequently updated) available at the DNWMD website. 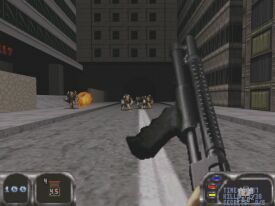 Nuclear Showdown is a mini-mod that enhances the original Duke3D in various ways. Unlike DNWMD, NS is not really a whole new deal, but rather like a booster pack. 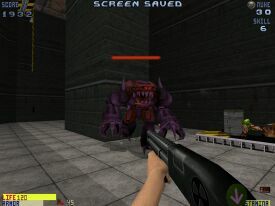 Changes include new enemies (mostly old enemies with new abilities like Enforcers with flamethrowers), new weapons (such as an uber powerful Desert Eagle!) and plenty of new effects and enhancements, most of which tend to stay small enough so that they don't completely alter the mechanism of the game (unlike DNWMD). For example, you need a space suit to safely enter a vacuum, you can blow enemies' heads off (and kick them around like footballs! ), footsteps now make a sound, some weapons can be manually reloaded and so on. Now, you need a playing field for these guns and since the original Duke has been around for so long James made the right decision by doing what DeeperThought did with his DNWMD mod: instead of assembling a team that never gets anything done he simply took some of the finest (mostly city) usermaps around and turned them into a new episode. The levels have been very well picked but the actual story (if you can call it that) doesn't seem to kick in until a briefing map a bit over halfway through. Somekind of a short briefing map should have started the usermap episode as well. However, at this point (after the briefing map) the usermap episode starts to stretch and you get the "make it stop" feeling. I think it'd have been a better idea to cut the episode in two pieces, with the briefing level being the first map of the second usermap episode. 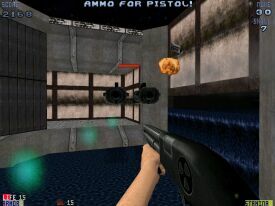 Also, while the levels are mostly well balanced in terms of ammo & such the second half didn't seem to provide the Plasma Gun or the Lead Cannon at all (or I simply missed them). Another fun pack that allows you to get more out of Duke3D. The usermap episode, however, gets tiresome after the city part.